in their respective areas. It is important that aviation instructors not only know how to teach, but they also need to project a knowledgeable and professional image. In addition, aviation instructors are on the front lines of efforts to improve the safety record of the industry. In training to be an Initial Certified Flight Instructor you will be training to become a professional educator in the specialized area of flight. At the same time you will hone your flying skills to the highest level. The core of the training will focus on the fundamentals of instructing, regulations and documentation, preparing and presenting lesson plans both in the classroom and in the aircraft, and assessment skills. What Can You Do With An Initial Certified Flight Instructor Certificate? 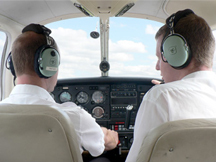 An Initial Certified Flight Instructor may provide both knowledge and flight training to those seeking a Private Pilot or Commercial Pilot license. Additional privileges include providing pilot supervision, pilot proficiency, and additional training in different aircraft makes and models. 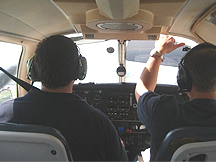 Expand your instructing privileges to include instrument training. In training you will learn everything necessary to thoroughly and competently teach instrument flying skills. 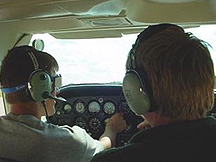 At the same time you will hone your own instrument flying skills to the highest level. Training will consist of both classroom sessions on the ground as well as sessions both in the flight simulator and in the aircraft. All flights will be training flights with an instructor on board. Upon completion of the training you will take a license exam. What Can You Do With An Instrument Certified Flight Instructor Certificate? An Instrument Certified Flight Instructor is afforded the same privileges as an Initial Certified Flight Instructor, and in addition may provide both knowledge and flight training to those seeking an Instrument Rating. Additional privileges include providing pilot supervision, pilot proficiency, and additional training in different make and model aircraft specific to Instrument Flying operations. Expand your instructing privileges to include multi-engine aircraft. In training you will learn everything necessary to thoroughly and competently teach multi-engine flying skills. At the same time you will hone your own multi-engine flying skills to the highest level. What Can You Do With A Multi-Engine Certified Flight Instructor Certificate? A Multi-Engine Certified Flight Instructor is afforded the same privileges as an Initial Certified Flight Instructor (or Instrument Certified Flight Instructor, if applicable), and in addition may provide both knowledge and flight training to those seeking a Multi-Engine rating. Additional privileges include providing pilot supervision, pilot proficiency, and additional training in different aircraft makes and models specific to Multi-Engine operations.